First published in 1885, poet and storyteller Robert Louis Steven­son’s classic tribute to the lives of children has delighted readers for more than a century. From flying through the air on a swing to building an imaginary world out of blocks to being tucked into bed for a night of sweet dreams, A Child's Garden of Verses is a joyful celebration of imagination, wonder, and what it means to be a child. Lavishly illustrated by beloved artist Barbara McClintock, this new unabridged edition of these classic verses is sure to capture the hearts and imaginations of both young and old for years to come. Poet and novelist Robert Louis Stevenson (1850-1894) was the author of a number of classic books for young readers, including Treasure Island , Kidnapped, and Dr. Jekyll and Mr. Hyde. 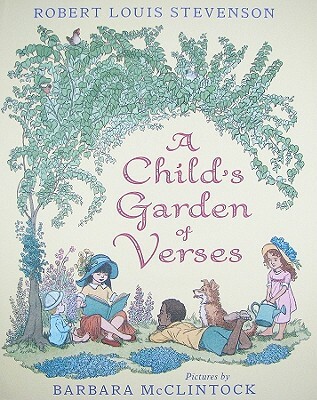 Born in Edinburgh, Scotland, Mr. Stevenson was often ill as a child and spent much of his youth confined to his nursery, where he first began to compose stories even before he could read, and where he was cared for by his nanny, Alison Cunningham, to whom A Child's Garden of Verses is dedicated. Barbara McClintock has written and illustrated many acclaimed books for young readers, including Adèle & Simon, an ALA Notable Book, a Children's Book Sense Pick, and a New York Times Book Review Best Illustrated Book of the Year, and Dahlia, a Boston Globe-Horn Book Award Honor Book. She lives in Windham, Connecticut.